(Oct 31): Wall Street pulled back from record-high territory on Monday, weighed down by a drop in Merck shares and a report that U.S. lawmakers are discussing a gradual phase-in of much-anticipated corporate tax cuts. Market watchers pointed to declines steepening after a Bloomberg report that the House of Representatives was discussing a gradual cut in corporate tax rates over several years. "A lot of people are looking to that corporate tax cut as a reason for the next leg up in stocks," said Rick Meckler, president of LibertyView Capital Management in Jersey City, New Jersey. Investors were also digesting the impact to Trump's agenda from news that his former campaign manager, Paul Manafort, was charged with money laundering in the federal probe into Russian meddling in the 2016 presidential election. “We are in a market that has just been on an absolute low-volatility, steady climb for quite a while, so you don’t need much of a reason for it to take a periodic step back, particularly a small step back," Meckler said. 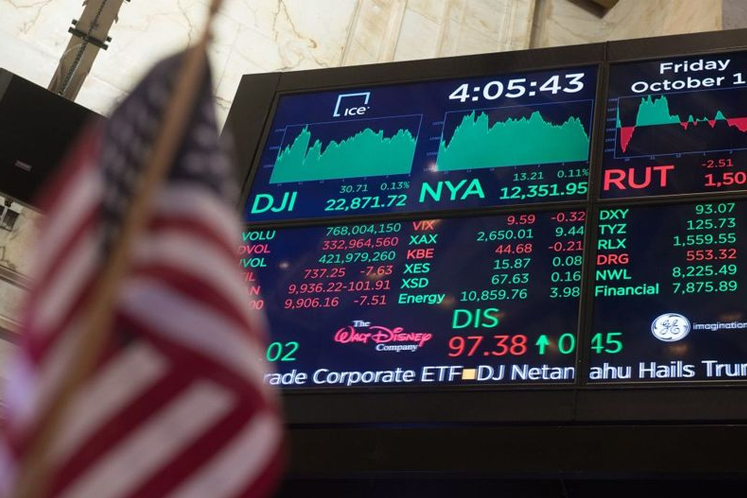 The Dow Jones Industrial Average fell 85.45 points, or 0.36 percent, to 23,348.74, the S&P 500 lost 8.24 points, or 0.32 percent, to 2,572.83 and the Nasdaq Composite dropped 2.30 points, or 0.03 percent, to 6,698.96. Stocks pared losses late in the day amid signs that Trump was close to picking Federal Reserve Governor Jerome Powell as head of the U.S. central bank. The New York Times reported Trump was "expected to" name Powell as soon as Thursday to replace Janet Yellen as Fed chair, after Reuters reported earlier that Trump was likely to pick him. The tech-heavy Nasdaq touched an intraday record high earlier in the session before pulling back. The S&P tech sector rose 0.4 pct, following big gains on Friday in the wake of a strong batch of earnings. Apple shares gained 2.3 percent after analysts pointed to strong demand for the iPhone X.
Merck shares fell 6.1 percent after a setback to its key cancer medicine. The stock was among the top drags on the S&P 500 and Dow industrials. In other corporate news, the board of Japan's SoftBank Group Corp is having doubts about the merger it has been negotiating between its U.S. wireless subsidiary Sprint Corp and T-Mobile US Inc, due to fears of losing control of a combined entity, a source familiar with the matter told Reuters. Sprint shares fell 9.3 percent and T-Mobile ended off 5.4 percent. Market watchers readied for another big week of corporate results. With more than half the S&P 500 reported, third-quarter earnings are expected to have climbed 6.7 percent, up from an expectation of 5.9-percent growth at the start of October, according to Thomson Reuters I/B/E/S. The Fed is also due to meet this week, adding to the heavy week of economic and financial news. The October jobs report is due on Friday. Declining issues outnumbered advancing ones on the NYSE by a 1.55-to-1 ratio; on Nasdaq, a 1.96-to-1 ratio favored decliners. About 6.6 billion shares changed hands in U.S. exchanges, above the 6 billion daily average over the last 20 sessions.